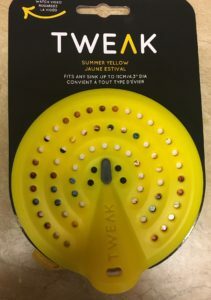 TWEAK sent me their summer yellow sink strainer. It is SO easy to use. After 4 years of dealing with things going down the disposal, I have been searching for something to protect the disposal from foreign objects. This was designed for the regular side of the sink and works very well. We love that it works so easily and effectively and you barely have to touch the particles in the sink. Here is the facebook live so you can see how it works! The three pins accidentally got thrown away, so KEEP them. 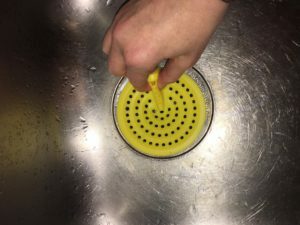 It helps customize the strainer to fit your specific drain. In my case the TWEAK fits just fine. 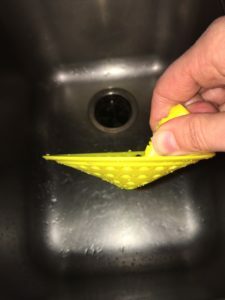 The strainer is made from 100% silicone, dishwasher safe, not tested for use with garbage disposal (but it works with ours), and the design is patent pending! 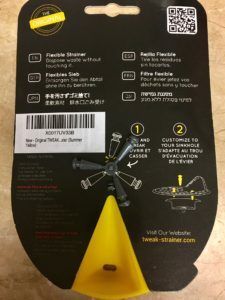 The TWEAK strainer has a great design that is simple and extremely effective. It even comes with pins to customize the fit any sink. The silicone is extremely flexible and durable I have yet to stain it and it is dishwasher safe. Plus, it won’t scratch your sink. The TWEAK strainer is designed to fit any drain with a diameter up to 4.3 in. The Easy’Click pins sit in the strainer holes. When you’re done with the dishes, simply TWEAK it by pinching the top to keep all mess inside the strainer. It creates a little spatula to tap the bottom side (shown above) into the trash. 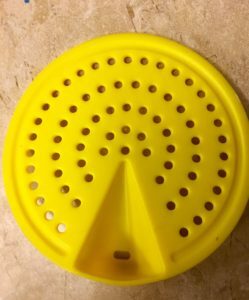 The TWEAK strainer comes in an a selection of beautiful colors; Summer Yellow, Lucky Purple, Cool Gray, Wild Pink, Ocean Blue, Happy Green.